He will enter his WBC middleweight fight with Miguel Cotto (40-4, 33ko) in Las Vegas a slight favourite in the eyes of many fans and trade insiders, especially given his youth and natural size and strength advantages over the Puerto Rican champion, however Saul “Canelo” Alvarez (45-1-1, 32ko) is keen not rest on his laurels, telling media on this week’s press tour that he will leave no stone unturned in his preparations for the November 21st Mexico v Puerto Rico mega-fight. “I feel the honor and pride of fighting for my country. 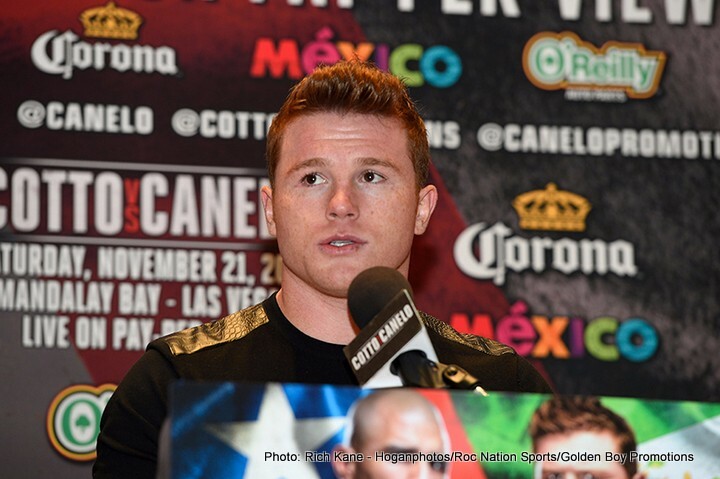 (It’s a) big responsibility and the best thing I can do to honor that is prepare and win my fight,” Canelo said. Cotto is said to be unwilling to go to war and trade with the younger man, and will “fight smart” under the guidance of 7x trainer of the year Freddie Roach, who claims to have developed a solid game plan to negate Canelo’s best work – a game plan heavily reliant on movement and footwork that will also draw on the vast top-level experience Miguel has gained over his long, Hall of Fame worthy career. Canelo -nine years Cotto’s junior – rejects the notion that the experience of the 34 year old champion will be a crucial factor in the fight, and say he can draw on plenty of his own, which includes common opponents Shane Mosley and Floyd Mayweather, as well as a victory over Austin Trout in 2013, 4 months after “No Doubt” upset and out pointed the Puerto Rican at Madison Square Garden. “I might be a young fighter but I also have a lot of experience. I think we’re both going to prepare very well and whomever is better prepared should win,” Canelo added via his tranlastor. Canelo dominated James Kirkland and knocked the American out inside 3 rounds in Texas, one week after the Mayweather/Pacquiao disappointment. Cotto last beat Australian former middleweight champion Daniel Geale, stopping his man in 4 back in June’s equally dominant showing at Madison Square Garden.